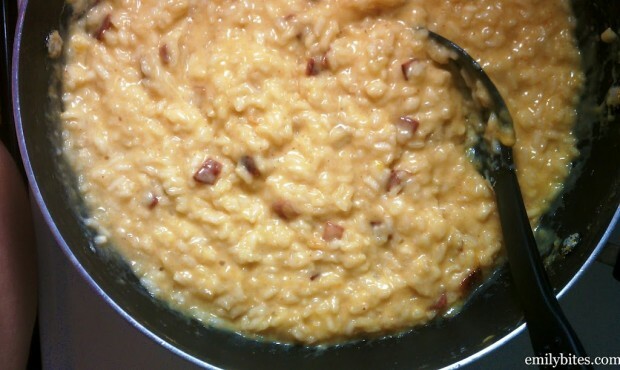 This Bacon, Cheddar and Beer Risotto is not one of those pretentious, intimidating, fancy-schmancy risottos. Don’t get me wrong, I love those too (see Tomato Sausage Risotto or Mushroom Risotto). This risotto contains beer. And bacon. And a mound of cheddar cheese. This risotto would rather hang out at the corner bar, high fiving its friends and flirting with the server than slip the maitre d’ a few bills to be escorted to the premier table in a fine dining establishment. It would feel more comfortable perusing the aisles at Target than swiping its platinum card on 5th Avenue. 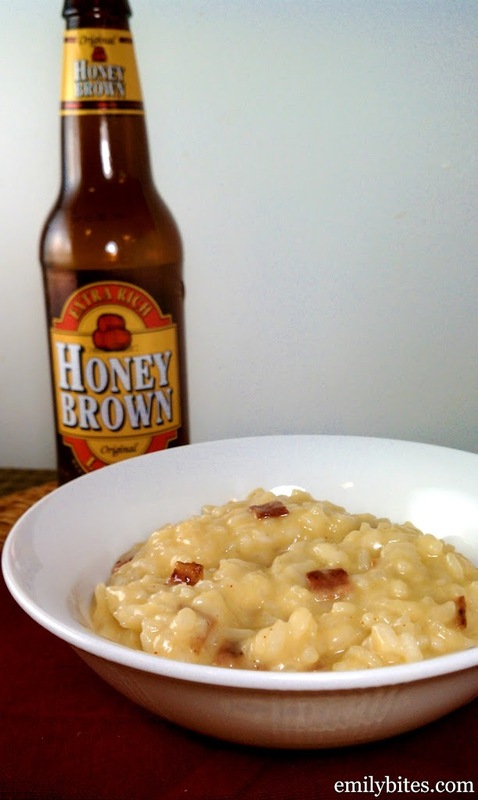 This risotto is a rich, cheesy bowl of creamy rice with a tangy beer flavor and bites of smoky bacon. It’s delicious. Like all risotto, this takes some time to make since you have to stir the broth in a little at a time, but it’s worth it. This may not be the most elegant risotto out there, but it’s not trying to be. It knows what it is and it’s going to fill your belly, make your taste buds sigh with comfort and happiness and send any and all dinner guests home with smiles on their faces. So, serve this and be proud! It’s like a guilty pleasure, minus the guilt. Place the butter in a large sauté pan and bring it over medium-low heat until butter is just melted. Add onions and cook 3-5 minutes until the onions are translucent. Add the garlic and cook for another minute until garlic is fragrant. Add the rice and stir to combine. Cook an additional 2 minutes, stirring throughout. Pour in the beer and turn the heat up to high until the beer begins to simmer. Reduce heat back to medium-low and add ½ cup of the chicken broth. Stir until the liquid dissolves and then add another ½ cup. Repeat until all the broth has been added and the rice is creamy and al dente. 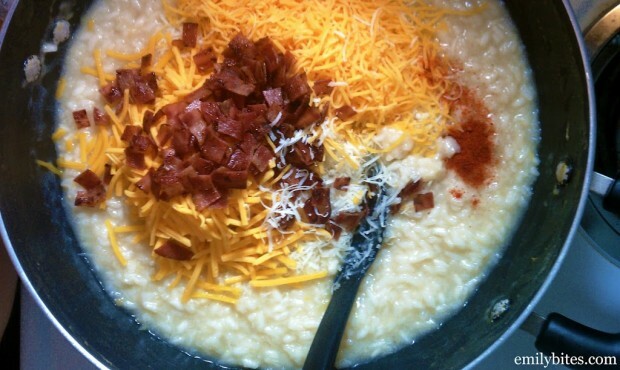 Remove the rice mixture from the heat and add the cheeses, bacon and cayenne pepper. Stir until thoroughly combined and serve. ARE YOU FOR REAL??? This recipe looks AMAZING!!! Can’t wait to try it. And I voted for you. 🙂 Good luck. Thank you, Jenny!! I hope you love this! Sounds delish! Already added it to the menu for next week. Can’t wait to try it! Voted! And i’m collecting beer recipes for my home-brewing hubby! How long from start to finish did this recipe take – just curious? Betsy – I actually prepped everything and then got a phone call and was chatting and cooking at the same time so I totally lost track of how long it took. I’d say set aside at least an hour. Thanks for voting! Do you think I could use three cups broth and three cups water? I’m trying to cut down the sodium per serving, but I do mot want to sacrifice taste. Haha, I figured some people would get a kick out of cooking with beer :). I’m so happy you both loved this! Had this for dinner last night. SOOO good and hubby couldn’t believe it was WW friendly. Served it with a 5 oz lean steak (on the grill…weather is divine here) and a big garden salad. Perfection! Ooh, that sounds like an amazing meal! Glad to hear this was a hit with both of you. Thank so much for letting me know! Thanks Elina! 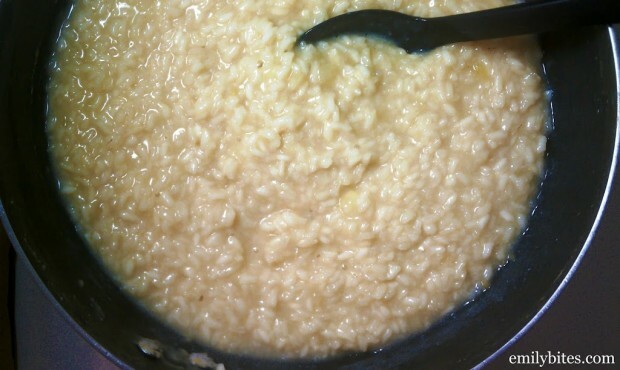 I agree about risotto…it sounds daunting, but I actually really enjoy making it. Hope you try this one and love it! Does it matter what kind of beer you use? I have one Guinness in the fridge (leftover from St. Patrick’s Day) but I’m worried it might be too heavy. I bet Guinness would be great in this! I am not a big beer drinker so my beer selection was basically based on what bottled beers my parents had at their house when I dropped by to snag a bottle :). THIS WAS AMAZING!!!!!!!!!!!!! I used Corona and Goat Cheese instead of Parm cheese. It was so good!! My hubby is drooling over my shoulder…. I won’t tell him it is WW friendly, but I’m super excited to try it!! Thank you! I appreciate it. I hope you and your husband both love this! Another keeper from Emily!!! BTW…I voted for you over at Fitness Mag. CONGRATULATIONS on the nomination…so well deserved!!!!! I just found your website and I am excited to try some of the recipes out they sound amazing! I have kind of a weird question, but do you happen to have any suggestions for how to omit the beer from this recipe and still make it? This recipe sounds amazing but I really really hate the taste of beer and while cooking I try to make only one dinner for the family each night and don’t think I can serve my little one food with beer in it. Thanks! Well, risotto usually has wine in it (this one just happens to have beer), but if you prefer not to cook with alcohol at all you can just substitute more chicken broth. I don’t drink beer at all (not a fan either), but I liked it in this! Hope you try this and like it! I just wanted to let you know that I did end up trying this dish by substituting chicken broth for the beer and it was fantastic. I have to admit I have never had risotto before, but this just looked to amazing that I had to try it! Even my husband (who claims to hate rice)loved it! Thank you so much for sharing this recipe! Emily, this was awesome! I used all Cabot reduced fat sharp cheddar instead of the two varieties, but otherwise followed the recipe. My 11-year-old helped me make this until he got bored with all the stirring, but he definitely enjoyed the finished product. I served it with sauteed shrimp and roasted brussels sprouts. We’ll definitely have this again! I would like to make this for a bridal shower. The bride enjoys beer. Is there a way I can eliminate the last minute prep and make it before the guests come? I followed this recipe exactly & it came out DELICIOUS! It did take me about an hour but once I turned to heat to medium-high and stirred continuously, it started to go quicker. Next time I’ll start with the higher heat! My hubby loved it, had 3 bowls, and his only complaint was “not enough bacon”. Next time I’ll reserve 2 more slices for him to crumble on top! Made this last night and everyone (even the kids) liked it. It’s time consuming, but well worth it! And it makes a ton. Made this tonight and it was so delicious! My hubby and I both enjoyed it a lot! It makes so many servings and every bite is cheesy and hearty. We did think it could use a bit more spice and may add salt, pepper, or more cayenne on our next go. Overall, wonderful recipe and well worth the time you put into it! OMG…this was so effing delicious! And VERY filling! Haha, I’m so glad you loved it (and that it didn’t taste like garbage ;)). CONGRATS on losing 11 pounds so far – that’s awesome!! WW is totally fun when you can eat foods you love and watch the pounds melt away. So glad you’re loving it, thanks so much for your comment! It was just delicious! My only thought/comment/concern is mine seemed to go ‘gummy’ fast is that normal? I’m not sure if the leftovers will be as good because of this…I’m hoping to make Arancini (risotto balls) tonight or tomorrow night! I made this tonight and it is UNBELIEVABLE! SSOOOO good! Even my persnickety husband said it was amazing! Thanks for sharing. I can’t wait to try more of your recipes!